This map comes from testimony [PDF] given today in a House Homeland Security Subcommittee hearing by Coast Guard Rear Adm. Charles Michel, who heads the U.S. Southern Command’s Joint Interagency Task Force South (JIATF-S). Based in Key West, Florida, Adm. Michel’s agency monitors all suspicious air and sea traffic headed toward the United States from the Andes and across Central America and the Caribbean. 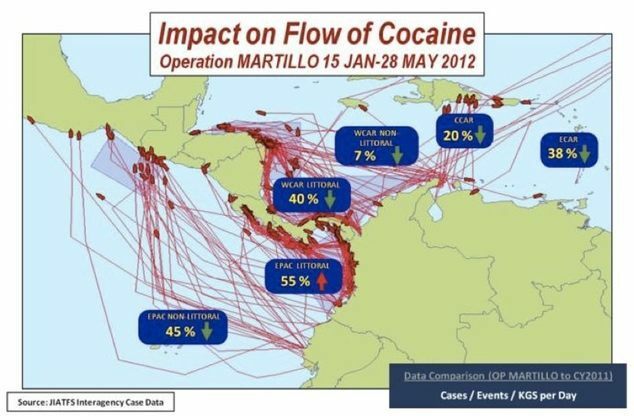 The map shows the effect that JIATF-S is measuring from “Operation Martillo” (Martillo = Hammer), a “surge” operation to increase surveillance and patrolling in waters near Central America. Operation Martillo began in January, and Southcom (especially the Navy’s 4th Fleet) and the Coast Guard are coordinating it with several Latin American and European security forces.US. is a nation that has many classes and people from all across the globe, staying there for the law flexibility and the order maintained. The hopes of livelihood to be better also goes up, with the help from systems like Fintech Ltd, which has been claiming to give good returns on investments. So, give it a try and see your money make money!